For digital marketers and site owners, heavy traffic is the most exciting news because it can generate favorable profit. And this is no exception for digital publishers and writers as they really need people to read their digital publications, the more, the better. And Pub HTML5 can help you achieve all these by converting a dull PDF file to a gorgeous online digital catalog with vivid sliding effect and visual rich media. However, on the contrary, sometimes we have something to hide from excessive exposure and we just want to share with families and friends. For example, you won't be willing to share your family tree with strangers. Similarly, you will never want to show your company confidential info or strategy to the public especially rivals. Still, you want to share with some specific persons. But how can you make your online digital catalog only available to those who have been granted with access permission by you? Pub HTML5 will help you with this even after you publish the HTML5 digital catalog online. After you start Pub HTML5, click "Import File" to import a PDF file and in the next screen, you can design the page slide digital catalog with a set of settings: template, theme, background, background sound, book language, feature buttons and so on. Click "Upload Online" and login with your account. And in the pop-up dialog, define title, description, and keywords and select a category folder. 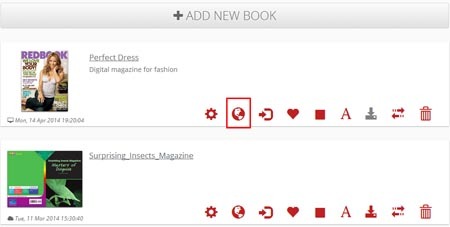 Next, click "Publish" button to start uploading the catalog online. And after the catalog is uploaded, you will get an URL for the online catalog and you can open and view the catalog via the browser. 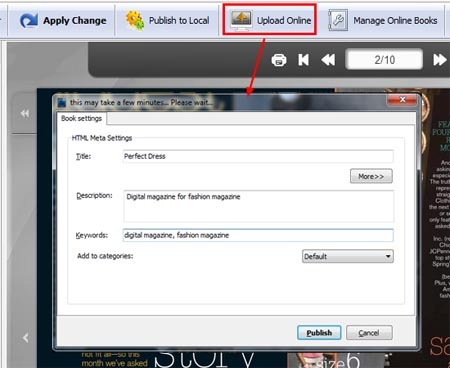 Click "Manage Online Books" to open Online Book Management. 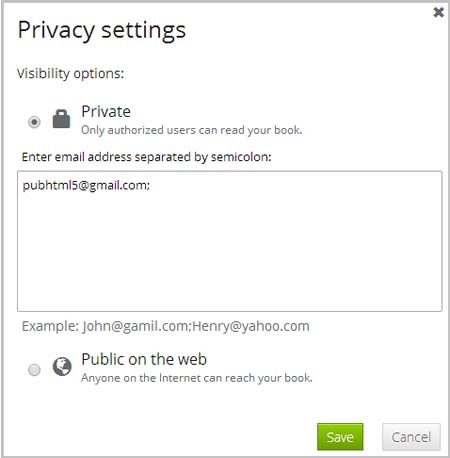 Locate the online publication you just uploaded, and click the "Public" icon, then you will see the Privacy settings dialog. Select "Private" and enter email address(es) that authorized users use to access your online catalog. At last, save the settings.